Simple updates or a remodel can make the world of a difference to add value to your home. It is very beneficial for homeowners to make these renovations. Although, many find it difficult to make their visions come to life, which is why our design team is ready for your call. Our design experts will work within your set budget and create a bathroom or kitchen that you have been waiting for. Every project, new construction or remodel we follow a 4 step process to give our clients their dream space. Analyze the space, take measurements. Plan & create your design. Establishing a budget and making it work. 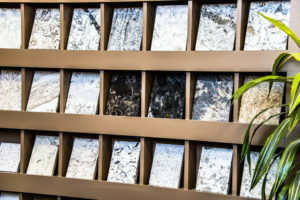 Countertops can be a tricky product to choose for your bathroom or kitchen. If choosing countertops for a kitchen you need a durable material, that is scratch, stain and heat resistant. When choosing new counters for a bathroom remember that it too will get a lot of use and abuse. Choosing a surface that doesn’t hold moisture, easy to clean and stain resistant to spilled beauty products will be factors you need to keep in mind. This is a fun detail to choose for your renovation. Sinks in general get a lot of use, especially in the kitchen. 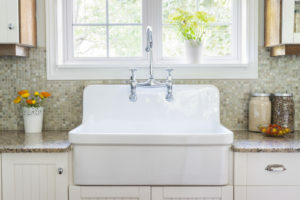 You will need a sink that is sturdy, scratch and stain resistant. Our designers will help you choose from a plethora of options. We will determine the measurements and help you find a style that will match perfectly with your new kitchen or bathroom renovation. When evaluating pricing, we highly recommend to go for the brands that have a good reputation in the market. That way, paying a little higher price would be totally worth it, as a high-quality sink would survive everything without a damage, whereas, the cheaper qualities would prove costly in the long run.